The Bulldog 10K Fifth Wheel Landing Gear System makes leveling and hooking up easy with just the push of a button, 10K Static, 10K Lift, Dual Drive, spring loaded drop pin, heavy duty large foot pads, and motors that are preassembled to jacks make operation and installation a breeze! If you own a 5th wheel you have probably looked at landing gear before only to see other systems usually have only 1 motor or are manually operated with a hand crank. These style jacks are time consuming to operate, not to mention one motor systems do not level individual legs on uneven ground. The Bulldog 5th Wheel Landing Gear System does all these things and more. The Bulldog 5th wheel landing gear system has been designed to make your life easier when it comes to hitching, unhitching and leveling your 5th wheel with just the push of a button. The 10k static and 10k leveling and lifting means the Bulldog 10k 5th wheel landing gear system is made for large 5th wheels. **Note it is not recommended to use landing gear to lift your RV for things like changing tires and maintenance. When traveling around the country some campsites may be at an angle, or have soft spots in the soil. The jacks you use have to be able to compensate for these things to give you and your family stable and level living areas. This Bulldog 5th wheel jack system does that, with heavy gauge footplates measuring 6” x 8” that self-level to keep your RV even and firmly planted on the ground. If you are in a hurry to get on the road, the high speed operation will lift your 5th wheel for hitching at 9” a minute, twice as fast as the competition! These lifting speeds help you quickly and painlessly level your 5th wheel to allow you more time to put your feet up in comfort at your campsite. With the easy to use spring loaded drop pin, simply pull out the pin when you are ready to start leveling and the legs drop down! Each leg is independently controlled by the switch panel allowing you to raise one leg and lower another if you are at an uneven campsite. With some other landing gear systems you have to add the motors to the jacks, not with the Bulldog 5th Wheel Landing Gear System. The motors are already attached to the jacks, ready to be installed. Making your job of installing one step easier. Most gear boxes are made of plastic, not this one! The Bulldog 10k 5th wheel landing gear system gearbox is made heavy duty die casted metal to last for the long haul. 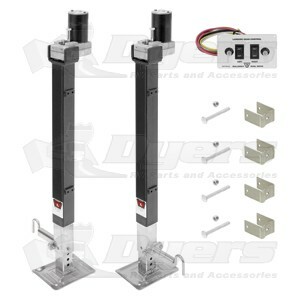 Bulldog 5th wheel leveling jacks come with an Industry leading 5 year warranty. You can purchase with confidence knowing that Bulldog will be there if something goes wrong. Screw Travel is 18 inches. Two Switches & Panel, Wiring Harness, Mounting Hardware & Spring Loaded Drop Leg Pins. Order arrived in just a few days. We had to do a few modifications to the brackets, but overall very pleased! i received my new bulldog landing legs in 2 days they fit like a glove everything worked just the way i needed them to. They work great but I had broken the shaft on my first set and that part alone is not available so I had to purchase a whole new set of jacks. Purchased these to replace faulty one motor jacks on our 36' Montana. Purchased these to replace faulty one motor jacks on our 36' Montana. Very easy to install and so dar work great! A bit spendy but well worth it. due to my fifth wheel i had to get the landing gear installed by d&r steel construction in Towanda, pa . they installed the bulldog and what a difference. lifted my arctic fox 29-5 as if it was nothing. the bulldog was constructed well not even a sharp edge. my life is going to be much easier with the bulldog. i do highly recommend this product.